It's not needle felting. It's not wet felting. It's not fulling. It's Artfelt® , and it is revolutionizing the way we felt. 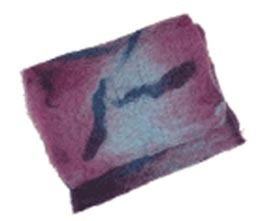 The Artfelting technique utilizes Artfelt® paper, a patented new paper specifically developed to ease and speed up the felting process. Artfelt® is simple to learn, quick to do and requires no knitting or previous felting experience. Artfelting can create felted material that is wafer thin as well as thick enough for a handbag all while allowing precision detail of design. The only thing that limits creativity with Artfelt® is your imagination; any felted piece your imagination can conceive, Artfelt® can achieve! 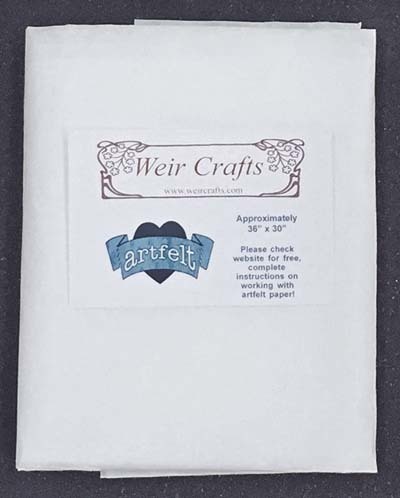 Click text to see a printed copy of Complete instructions for using Artfelt® paper. This is a good video showing the Artfelt felting process. Below are kits like the ones shown being made on the video! These kits makes use of both standard and pencil roving in 100% Merino wool. 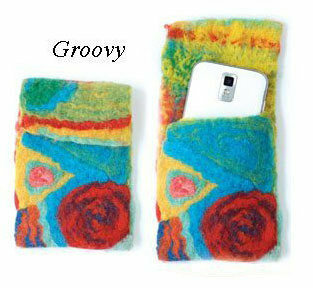 Comes in a bright colorway and is the perfect fit for your small electronic devices, such as cell phone, IPod or camera. This kits makes use of both standard and pencil roving in 100% Merino wool. This catch all purse for jewelry, coins, or whatnot can be make to look like the pictured image, or you can improvise and make your own design. Artfelt projects are a combination of a thin layer of wool roving spread out sideways to make a background, with the colorful pencil roving below arranged on top to form patterns and designs. An ounce of any of our wool rovings will work as the background, one ounce is about a yard and a half long, and is plenty for several smaller projects. This pure, Merino pencil roving, felts magnificently to create very soft and smooth fabrics. The color variations in the multi-colored pencil roving is never duplicated, thus you will always have an original piece. 50 gram skein with approximately 40 yards.